This is the first time that both heads behind Osborn Fiber Studio really collaborated on a design. We wanted a sweater that would really show off the new Kirby Meritime yarn, but it had to satisfy both Mum’s love for riotous color and my practical fashion sense. I lost track of how many pictures, sketches, and ideas went back and forth by email, and there were a few long phone calls. But I think we can both honestly say that we have a sweater that we both love and would both wear. 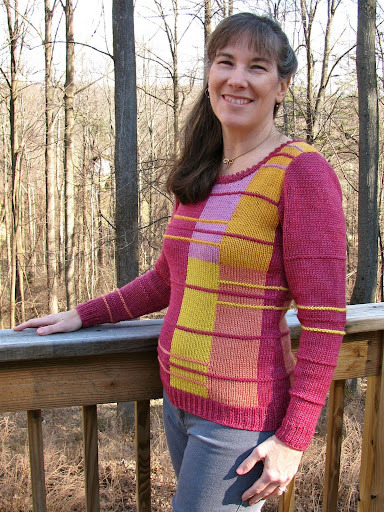 Lines plus curves, stockinette with a dash of garter. You can buy the pattern on Ravelry for 7$, or a color copy will be included for free if you purchase Mondrette as a kit (price varies by size; $7 discount). We have put two colorways together, one warm and one cool (below), and out of the five colors in each colorway, you can pick which will be the main color. This makes for ten available color combinations – or if you want to make a custom kit, just email me what colors you want and we’ll put one together for you. Not to mention that there’s a children’s version in the works. Both our names are on this design, but it was mom’s brain child, and her hard work that went into knitting it and writing the pattern. We both put a ton of time into charting and editing in the end. Mum, I’m so proud of you, and of us for working together! Thanks for putting up with all my demands. And thanks for all of you cool people who support this smallest of small businesses by reading, donating, and trusting us with your precious knitting time and yarn money when you buy our products. Rock it on. Love!! So unusual. I like simple designs but not boring ones. This works! P.S. Your mom looks too young to have an adult daughter Rebecca.